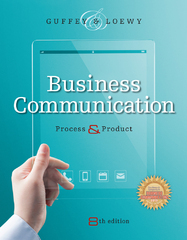 Business Communication 8 Edition A trusted market leader, BUSINESS COMMUNICATION: PROCESS AND PRODUCT presents the market's most innovative coverage of workplace communication skills with an expanded emphasis on digital writing. Compelling, new infographics and a vibrant new design appeal to today's visual learners. Most importantly, the hallmark features that made Guffey the market leader ? abundant model documents, the 3x3 writing process, case studies, and an efficient 16-chapter format ? continue to enhance student learning and comprehension. Vast instructor resources, including new video-enhanced PowerPoint slides, help new and veteran instructors plan and manager their courses.